The Michigan Legislature is poised to send bills to Gov. Rick Snyder that water down voter initiatives for paid sick time and a hike in the minimum wage. Volunteers call voters asking them to urge Governor Snyder to veto two bills that would modify paid sick time and minimum wage laws. 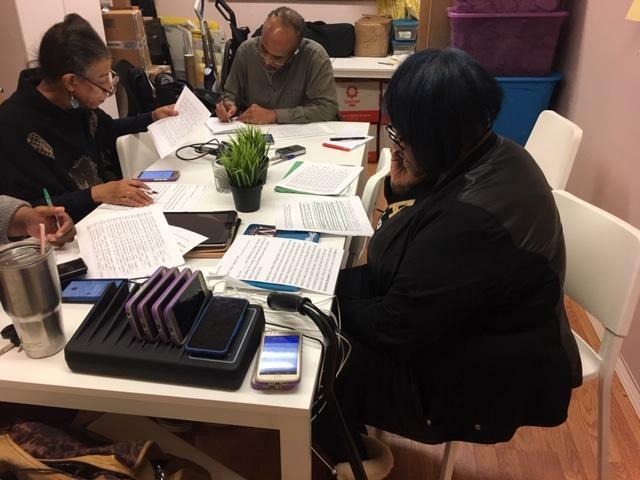 Last week, a handful of volunteers gathered for a phone bank at the Ferndale headquarters of Mothering Justice, a social justice group that aims to influence policies and laws to reflect the needs of mothers. Kim Hunter begins calling from a list the group previously used to garner support for a paid sick time initiative. He grabs his script when he reaches someone's answering machine. "Hello, my name is Kim Hunter," he says. "I'm calling with Mothering Justice and I'm calling to urge you to try to protect your right to earned paid sick time." Hunter and the others are encouraging people to call Governor Rick Snyder and ask him to veto two bills that are likely heading his way. One would delay a minimum wage hike to $12 an hour until 2030. That bill would also exempt tipped workers, giving them only a 48 cent an hour wage hike by 2030. The other bill would nearly gut a law giving workers the right to paid sick time. Exempted would be companies employing fewer than 50 workers - that's most companies in Michigan. Workers would also not qualify for paid sick time until they had worked for a company for a year. Phyllis Jacob of Mothering Justice says the issue is personal for her. Her daughter had to quit a job she loved because it didn't offer paid sick days. What she finds most heartbreaking is how the issue hurts children who get really sick. "They've told me that they've spent time in the hospital, and that their parents can't visit them, because their parents won't get paid," she said. The next day, the state Senate passed the bills. It was a surprise to no one. The state Legislature had approved the voter initiatives in September specifically to keep them off the ballot. That appears to be constitutional. Michigan's Constitution allows voter initiatives, but it does not ban the Legislature from adopting them to prevent them getting on the ballot, then immediately modifying the new laws. Supporters of the initiatives say they will sue, based upon a 1964 opinion issued by then-Attorney General Frank Kelley, who said the legislature couldn't adopt a law, then modify it in the same session. But legislators say they're confident there's nothing in the Constitution or the law banning the practice. The day of the Senate vote, Majority Leader Arlan Meekhof said the new laws would have been devastating to businesses. "We are doing what we believe is the best to keep Michigan's economic engine going," Meekhof said, "Providing the way for employers and employees to make their agreements together." Outside the capitol, activists and workers protested what was going on inside, calling it anti-democratic. Charles Dunne of Burton said this was the first time he became active in a political issue. "We can't allow lawmakers to silence our voices," he said. Business trade groups issued laudatory statements after the vote, but not every business owner was happy. Bethany Morton owns a Lansing catering business. She employs between 30 and 35 people. She gives paid time off, which can be used for sick time, to her full-time workers but not her part-time workers. Morton says she was worried about the cost of the voter initiatives - likely an extra $15,000 to $20,000 a year for her business. But she was crunching the numbers, figuring out how she would make it work, which might have involved an increase in her prices. But despite her reservations, Morton believes everyone should be able to call in sick on occasion and still get paid. What she really wanted from the state Legislature was clarification that employers could challenge workers who misused their sick days. "And then when I saw the final bill, I was truly shocked, because they really did, they just took out - everything," she said. So shocked, she's decided to go ahead anyway and offer her part-time workers paid time off, too. So did the state Legislature go too far? Ken Sikkema says he thinks both sides are abusing the initiative process. Sikkema was a Republican in the state Legislature for 20 years, and is now with Public Sector Consultants. Sikkema says he doesn't like that large sums of outside money funded the paid sick time and minimum wage campaigns, which he says was not the intent when the initiative process was enshrined in the state Constitution in 1900. And he says if the voter initiative had become law - and it turned out it had flaws - it would have taken a three-quarters vote to modify it later. "That's nearly impossible," he said. better to let lawmakers make the laws. "As much as it both sounds good and frankly is good to have a mechanism for voters to bypass the Legislature, people have to recognize once you do that, it's tough to change it," he said. There will be more phone banks and rallies this week. In the end, Sikkema says he'd be surprised if the pro-business Rick Snyder did veto the bills. Phyllis Jacob of Mothering Justice hopes he's wrong. "If Mr. Snyder could hear me, Phyllis Jacob, today, I'm asking you to please use your veto power and make this happen. Make your last act a good act," she said. Supporters of the paid sick time issue are already working on a backup plan. If necessary, they say they'll campaign to get paid sick time on the ballot again in 2020. Democrat Gretchen Whitmer will be governor then, and thus - it's hoped - more likely to veto bills aiming to keep it off the ballot. The state Legislature is moving forward with changes to a citizen initiative on paid sick leave. The measure to require employers to offer earned, paid sick time got enough signatures to make the November ballot. But the Senate pre-empted that in an effort to scale it back before it becomes law. The coalition pushing state lawmakers to give all workers paid sick days is growing. Groups backing bills introduced in Lansing last month held press conferences in Detroit, Flint and Kalamazoo Monday. Danielle Atkinson, who directs Mothering Justice, an advocacy group for working moms, was in Grand Rapids. If passed, she says the bills would help more than workers. “99% of restaurant employees don’t have access to one paid sick day and what that really translates into is restaurant workers going to work sick and getting everyone else sick and it becomes a public health issue,” Atkinson said. A state House committee this week will discuss whether to prevent local cities and towns in Michigan from passing laws requiring businesses to offer paid sick leave to their employees. San Francisco, Seattle and several other major cities have passed ‘paid sick leave’ ordinances in recent years. The intent is to protect people in low paying jobs, who stand to lose their job, if they try to take a sick day. 'Wage erosion' is shrinking paychecks in Michigan, but is hiking the minimum wage the solution? Michigan’s poorest workers have seen their paychecks shrink as the economy has grown. A new study claims Michigan workers in the lowest-earning 20% of the workforce are now earning about 55 cents an hour less than they did in 2009, when adjusted for inflation. Doug Hall authored the study for the Economic Policy Institute, a left-leaning Washington D.C. think tank. Detroit police arrested 39 people this morning during a protest outside a McDonald's on Grand River Avenue. The protest was part of a national campaign of planned strikes and civil disobedience to fight for a $15 hourly wage and the right to unionize. According to Commander Elvin Barren of the Detroit Police Department, the protest was peaceful, and about 350 people participated. In 1964, when legislators in Michigan created a state minimum wage, the idea was to create a system where no worker would be paid less than minimum wage. But in a departure from previous practice, the state agency that enforces the law ruled in a pay dispute case that agricultural workers are not protected under the minimum wage law. A question to boost Michigan’s minimum wage to $12 an hour could be headed to the November ballot. A petition drive says it’s gathered enough signatures to force the Legislature to adopt the initiative, or it goes to voters. Michigan’s minimum wage rose to $9.25 an hour in January. Campaign chair Alicia Farris says the initiative will not only increase the minimum wage again, it will also end the lower minimum wage for workers who earn tips.